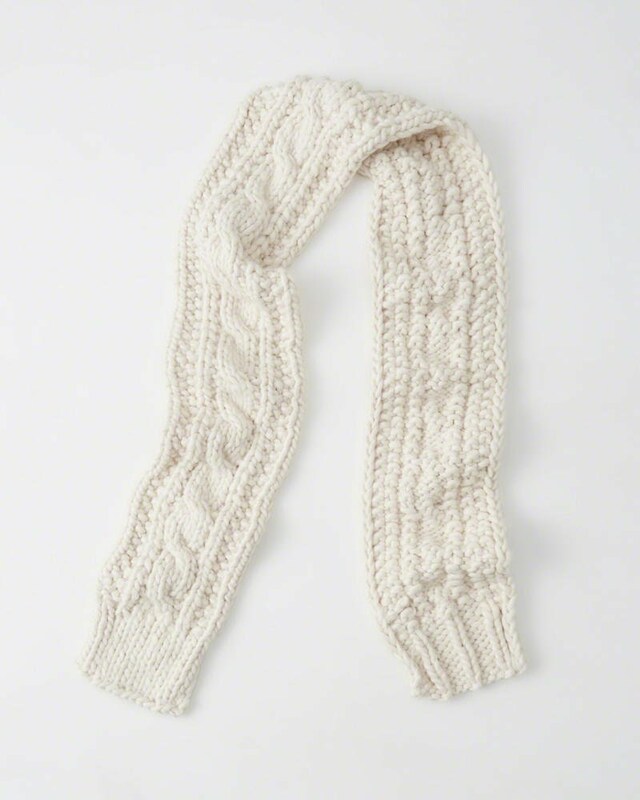 On a Black Friday shopping trip last year, Dova spotted this chunky cable knit scarf from Abercrombie & Fitch. The regular price was a $44 (ridiculous!) and at half price, it was $22. I immediately dismissed her wish to buy it because I could easily knit her one for less, even at half price! I snapped a quick photo to capture the stitch pattern and we left. It looked pretty straightforward with a cable stitch in the center and moss stitch on the sides. The first task was to find the appropriate yarn. With Michael's coupons, I picked up 4 skeins of Bernat Mega Chunky yarn 7 oz. in color Aran. In order to maximize coupon usage, this is technically 4 trips to the store at one coupon per type per day. Thankfully there is a store on the way home from my work (I actually did it in 3 trips, the cashier allowed me to ring up twice on the last day). At $6.99/skein, with two 50% off and two 40% off coupons, the total for the yarn was $15.38. Not so cheap after all! Full price for the yarn would be $27.97, so the Abercrombie scarf is actually cheaper at half price. Here are the yarn and needles with an Amazon affiliate link (if you don't have a yarn store near you). Get 3 skeins of 10.5 oz (big ball) or 4 skeins of 7 oz (regular ball). I picked up these knitting needles for the unbelievable Amazon Add-On price of $3.70. You can find size 19 (15mm) in other brands for under $10 on Amazon or at your local craft store (another trip with another coupon!). So my cost for creating this scarf ended up at $19.08, which only saved me $2.92 for my labor! Before embarking on the main scarf, I practiced on smaller scrap yarn to get the pattern right. I restarted it several times and graphed it out in Excel before I got something close. Dova was worried that I was making the scarf way too tiny and I had to assure her that I was just testing the pattern and that we could give it to one of her dolls or one of our cats. 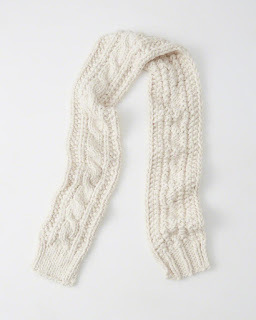 In the beginning, I got so frustrated with the edging and the look of the cable that I sent Doug to buy the scarf so that Dova could actually have what she wanted for Christmas. At that point, I had little hope of finishing in the right pattern in time for Christmas. Finally, I could do some side-by-side comparisons. Hey, not too bad at all! But the flip side (which I had not photographed and the scarf was not yet available online) had issues. Note to self: when photographing a pattern to emulate, take pictures of both sides! With the real scarf in hand, I was able to correct the weird rib on the backside next to the cable and see that there is a slip stitch that rolls to the backside for the edging. Since the scarf knits up so fast, I frogged it back to the ribbed section and started again. Now the backside is much better, look at that beautiful edging! The pattern may not be an exact replica, but it's super easy to remember while knitting. All the knit rows are basically the same and there are two types purl rows, one for the ribbed section and one for the main scarf. It's possible to use slightly smaller needles, somewhere between 10 and 15 mm. Abbreviation C4B: Slip next 2 stitches onto cable needle and leave at back of work. K2, then K2 from cable needle. I believe they did C4F (front), but I'm just used to the back, either way, it's just a cable in one direction. Repeat rows 17 and 18, then go back to row 15 and repeat this block for the main part of the scarf. When the scarf reaches 6.5 feet or so, end on a cable row and then switch back to Rows 2 and 3 for 13 rows (end on a purl row). Cast off on the knit side in pattern. The Abercrombie scarf is actually about 8 feet long, and this one is a bit shorter, but still long enough to be stylish. I prefer my handknit scarf myself! The yarn is shinier and silkier than the Abercrombie yarn, but it a bit heavier. 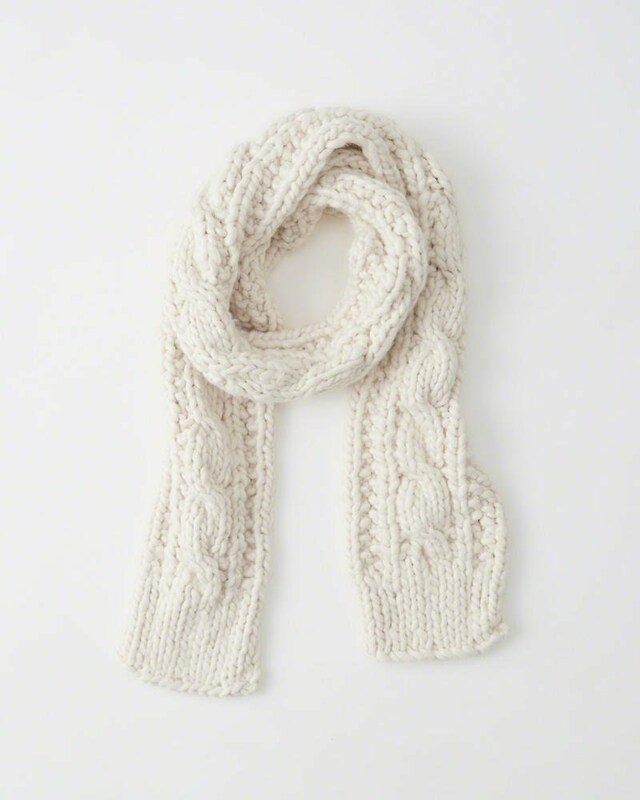 She's worn the Abercrombie scarf with the ends tucked into the loop so it looks like an enormous lifesaver. They could put her in the ad!